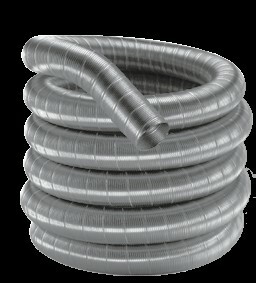 The DuraFlex SS stainless steel chimney liner is the most economical liner for straight chimneys. It has a light-weight 0.006" wall thickness that makes it stronger than other light liners. Its flexibility means that it can accommodate obstacles without the need for elbows or piecing of sections. This item provides 15 feet of the 5" diameter DuraFlex SS, which can be used to vent gas, wood pellet, oil, or wood appliances like fireplace inserts, furnaces, boilers, and water heaters. It carries a manufacturer's limited lifetime warranty. Liner is of good quality steel and is sufficiently flexible for tight bends. Get the DuraFlex connectors at the same time to make sure you get a good fit. Other brands might be slightly off in size and steel doesn't stretch much at all.